Even if the kids aren't ready for the park's more challenging hikes, families will love the cascading waterfalls, impressive Blue Ridge mountain views and dramatic driving route. 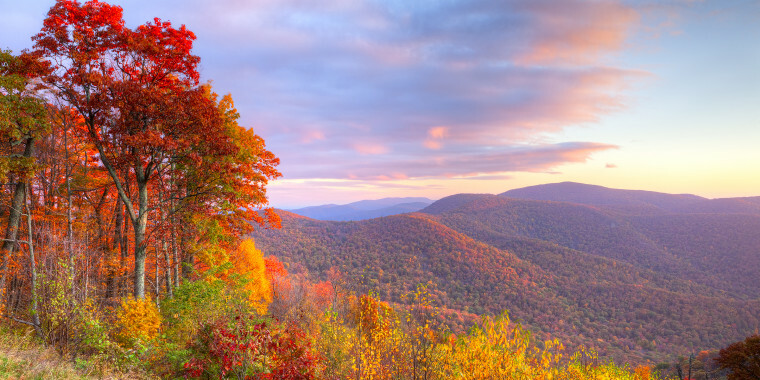 Skyline Drive, the 105-mile–long curvy road that runs the length of the entire wilderness area, is one of the park's biggest claims to fame. There are dozens of scenic overlooks for photo-ops and sharp-eyed passengers might spot deer, wild turkeys and black bears. Near the Harry Byrd Visitor Center is the trailhead for Dark Hollow Falls, an easy, 1.5-mile hike that's a good fit for even the youngest travelers and ends at the namesake 70-foot–high cascade. The Shenandoah Caverns in Quicksburg is the easiest of the area's underground sites for families to tour, thanks to the handy elevator. The hour-long journey includes stops at the famed multicolor "bacon" rock formations, as well as sites that sound like the stuff of fairytales, like Rainbow Lake and Diamond Cascade. There are two basic, comfortable hotels within the national park boundaries: Skyland Lodge, which is more spread out and, as the name suggests offers excellent views from some buildings, and Big Meadows Lodge, which feels cozier and is surrounded by forest. Accommodations at both include rustic hikers' cabins, family cabins with kitchenettes and lodge rooms with fireplaces. Baby back ribs are the house specialty at Hank's Grille and Bar, a popular smokehouse that's just 15 minutes by car from the park's Swift Run Gap entrance. There's even a quarter-rack on the kids menu, along with tried-and-true favorites like grilled cheese and chicken fingers. Want to pick up a picnic lunch before a hike? Stop at West Main Market in Luray for a panini or deli sandwich, since the park's concessions are fairly limited.